When you get an aquarium, you’re going to need a light. Not only do they make your aquarium look nicer, the fish appreciate them. You probably even tried picking out a light on your own. There are just a ton of lights available you have to choose from. We know the hassle of trying to buy products for your aquarium. 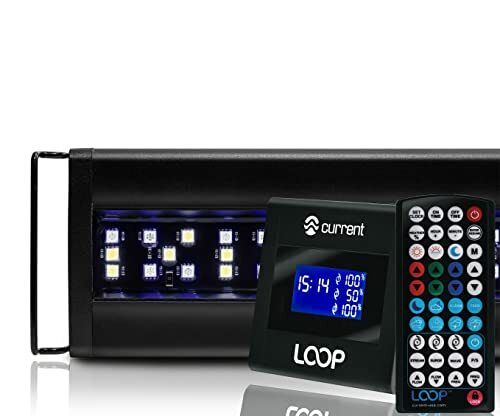 To help you out, we have gathered some of the best LED aquarium lighting you can find. Below we list the pros and cons of each aquarium light to help you pick the best product for your tank. When To Buy A New Light? Why Is Saltwater Harder To Illuminate? Do The Colors Affect My Fish? So why should you use LED lighting in your tank? Wouldn’t just a normal light work if you used it? Well, there are quite a few reasons you should consider using an LED bulb over a normal one in your tank. For starters, LED lights have a much longer lifespan than a standard light. There are LEDs out there that can last for upwards of 10,000 to 100,000 hours. This is much longer than the lifespan of a common light bulb that you may be accustomed to. LED lights are also brighter than most common light bulbs. This means that they better replicate sunlight for your fish. They can also influence plant growth if you buy a strong enough LED light. This can help create a natural habitat for your fish in the tank. The lighting itself can help reduce the stress in your tank by making your fish feel more at ease. Light is something that every creature on the planet needs. By providing light to your fish, it will help fight off disease and keep them healthier. Generally, LED lights are even heat resistant. This means they are made to keep running without overheating themselves. This can make them safer to use in your home especially if you have to go out for a while. Finally, LED bulbs will cost a lot less in the long run. Since LEDs last so much longer than standard bulbs, you’re going to be buying less replacement LED lights. 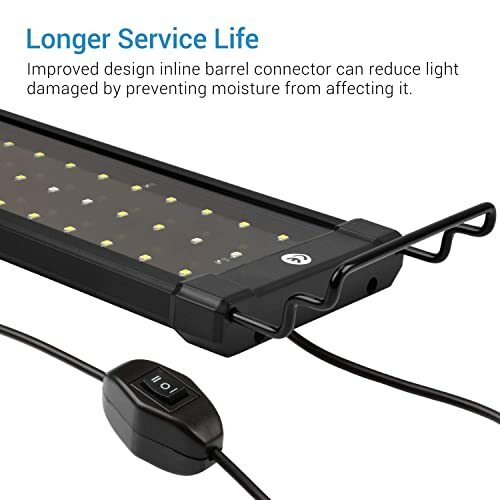 You may even go years before you have to buy another light for your aquarium. The Current USA Orbit Marine Aquarium LED Light is a beautifully-designed light. It’s perfect for people who love to have diversity in their aquarium. It even comes with a remote that you can use to change the light patterns. 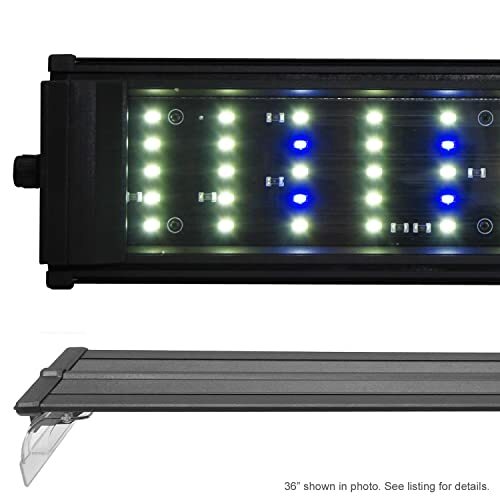 This LED light is perfect for simulating daylight for your fish. It has both a day and night setting that you can choose from a remote. It can even mimic different times of the day like the evening. 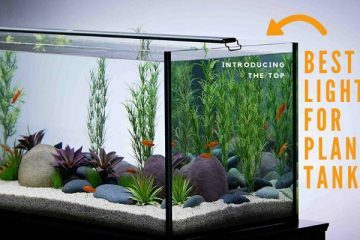 This device is even made specifically for saltwater aquariums. This light is made out of a ½ inch sleek aluminum housing. This light is water resistant and is made to fit a variety of aquariums. This light comes in several different sizes to make sure it can fit your tank. It can even be ordered for up to a 60-inch tank. As an added bonus, this light also comes with a wave maker. You can also control the WaveMaker wirelessly to stimulate actual water movement. The WaveMaker attaches to the side of your tank and should be pointed upwards towards the surface. Finally, there are some cons to buying this LED light. For starters, it doesn’t come with instructions to help you set it up. The timer that it comes with can also be a little bit unreliable. This means you may have to turn on the day setting or the night setting from time to time. The Current USA Satellite Freshwater LED Plus Light for Aquarium is great for freshwater tanks. This set of lights is made to be super bright to illuminate your whole tank perfectly. In fact, it is made up of 6500k white LEDs and a full spectrum of RGB LED lights. In short, this means that you can pretty much have your aquarium light up any color of your choice. This light also features multiple modes to choose from. It can properly mimic night in night time as well as natural weather patterns for your fish. To top it off it is also easy to install. It even has room to add on accessories if need be. It’s housed in tough aluminum to keep it durable for years to come. It also comes with adjustable docking to help fit a large range of tanks. It’s even incredibly sleek so it doesn’t stand out. Finally, you can use the included remote to program certain light patterns. This can help regulate your fish even when you’re away from home. It has a 120 g dispersion angle to make sure that every inch of your aquarium is properly lit. It also comes with a 30-day money-back guarantee. You’re probably wondering what the downsides of this product are. The LED lights in this product tend to die rather fast. Some lights only last for around a year. This light is strong but isn’t good enough to grow any plants in your tank successfully. 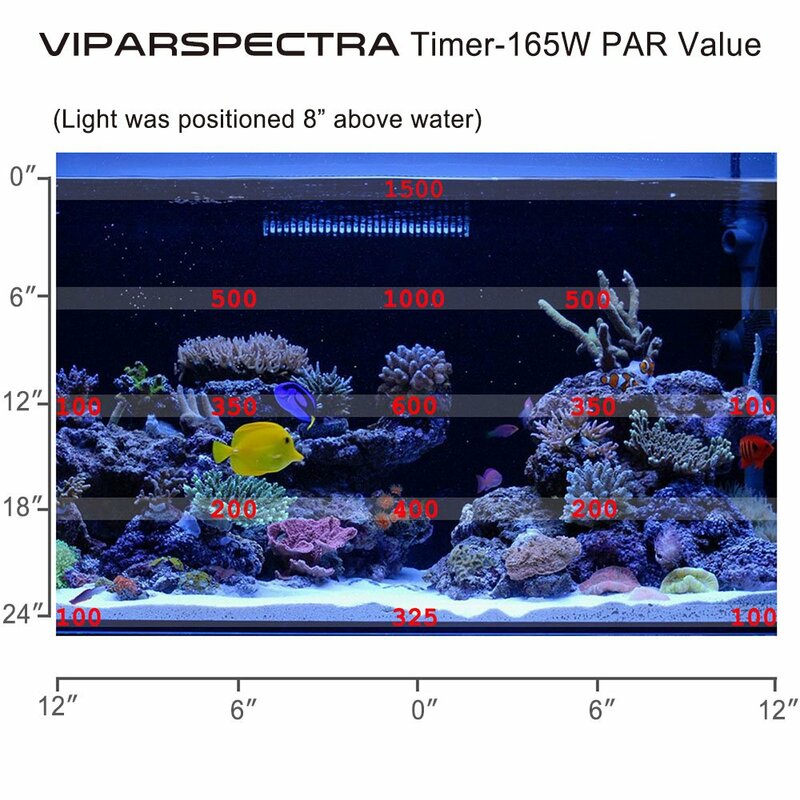 The VIPARSPECTRA Timer Control Series LED Aquarium Light makes life simple. The light is designed to look great and give you great options without being complicated. Its simple design is perfect for the fish hobbyist who doesn’t like complicated technology. 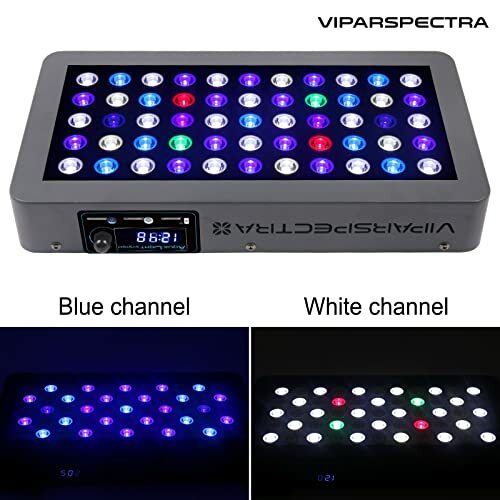 The LED has a full spectrum layout and advanced heat dissipation. the full spectrum light naturally mimics the sun. This helps grow coral in your tank and balance out your fish. The timer helps keep your tank and check even when you’re not going to be home. You can adjust the brightness of this light quite a bit. You can pick a brightness setting anywhere between 0 to 100%. This gives you a wide range of brightness options to choose from. This makes this light a simple but great choice for fish with special needs. This light also has wonderful heat dissipation. It has quiet fans and is made of aluminum to keep the light from heating up.The included remote also has only a few buttons to keep the layout simple. This light has both white and blue channels to choose from. Even simple lights have some cons. The lights amount of color blending isn’t that impressive. You may also notice that some of the lights flicker on and off. While this isn’t a common occurrence when it happens it can be rather annoying. The Beamswork DA 6500K 0.50W Series LED is even good for growing plants. This product is the latest in the DA series. The light is both energy efficient and powerful enough to grow plants. This means it will run up your energy bill just because it’s powerful.This version of the LED is fitted with 6500k Spectrum LEDs. This incredible amount of power is what allows plants to grow using this light. The setup is best used in freshwater. In saltwater the light may not be powerful enough to promote plant growth properly.The fixture itself is made to be sleek and razor-thin. This is so you can add this light into your aquarium without it sticking out too far. It also comes in a range of different sizes so that you can find the best fit for your tank. This light even goes up to an incredible 72 inches.This light comes pre-wired to work with a timer that you can add on to your purchase. The timer would turn the light on and off as needed during the day. With this light you also get a 90-day parts and labor warranty. This will guarantee that the company will fix any defects. Sadly, there are some cons. The coloring of this light is rather poor. While it is bright is not going to give you the beautiful lighting you’re looking for. These lights can also promote the growth of algae. The Current USA Fixture Orbit Marine Pro LED Light is the perfect light if you need high output. It is a little bit more complicated than the others but it’s completely worth it. Not only does it have a wireless remote control, it also comes with a wave pump. The LED light has several different settings for you to choose from. It slowly ramps up when you turn up the brightness and wont shock your fish. It has a 24-hour sunrise mode that you can use to naturally simulate day and night time for your tank. The wave pump can be turned on or off using the included remote. This can create a natural feeling of movement in your tank. You can even add another two pumps in the tank if you want a more natural habitat. The wave pump attaches to the side of your tank under the water.The light is incredibly thin and comes in an aluminum housing. It’s less than 1/2 inch thick making it perfectly blend in with your aquarium. But what also comes with some special effects like a shimmer effect. This light also has perfect color combination to help grow coral. This light does have its downsides though. This light doesn’t come with any instructions which can make operating it frustrating. There are also times when the timer is unreliable. This forces you to manually switch between day and night brightness. 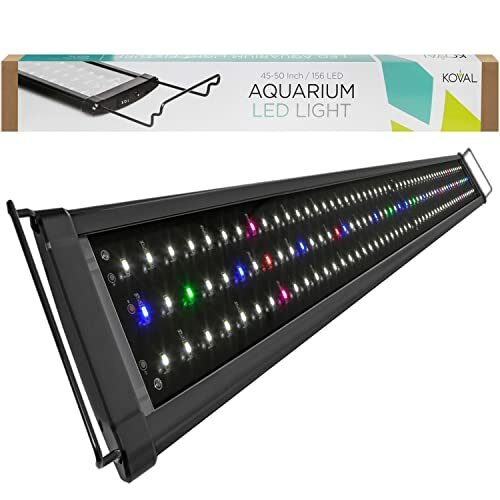 The Koval Aquarium Lighting Fish Tank Light Hood is easy to install. 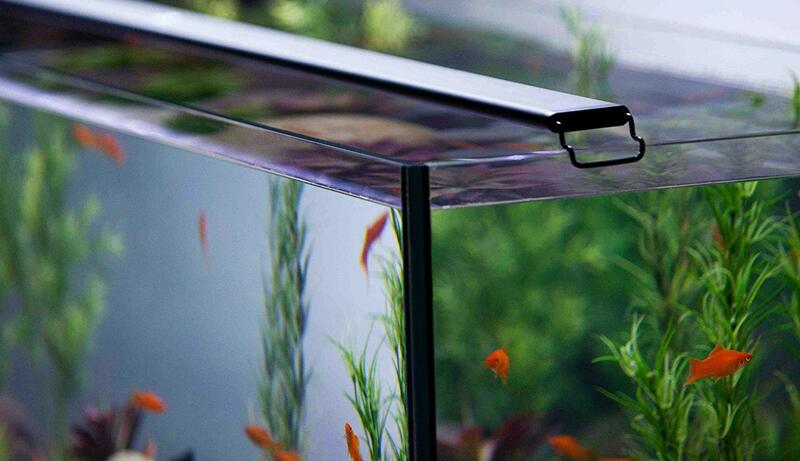 This is thanks to the extendable brackets that make this light perfect for most any aquarium. You won’t have to fight with the lights in order to perfectly install them above the water. This is another light that is perfect for growing plants. It is so powerful that it can bring out the life in just about any plant you decide to use. It is best for freshwater aquariums though it may not do as well in reef aquarium for saltwater tanks. This light is made of 156 bright LEDs that are five different colors. This gives you a little bit more than having just standard white LEDs. The LEDs are also energy efficient to give you bright lights without running up your electric bill. The LEDs are housed within an aluminum casing to properly protect them. This unit also comes with an extendable bracket to help it fit. On just about any tank it is easy to set up. It is designed so that the other lights keep burning even if one LED goes out. What are the cons to this product? Some of these lights arrive and are poorly assembled. This means that they can fall apart easily and you may have to screw them back together. This can lead to some LEDs possibly being damaged in the process. The Current USA 18″-24″ Satellite Plus PRO LED Light is great for all types of fish enthusiasts. 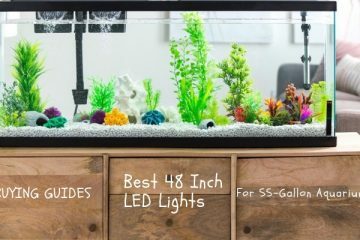 It is one of the best LED aquarium lightings out there. This model even comes with everything you need to make the perfect amount of light for your fish. To start with you’re going to get a remote to use. This remote is wireless and will let you change LED from anywhere in the room. This light is designed to produce higher color rendition and run brighter. It even comes with extra features for you to use. This light comes complete with dynamic weather effects. It also has several different lighting modes for you to use. This includes day and night mode to help regulate your fish. If that’s not enough it has realistic effects using the blue and white lights. This light is easy to install and made to be durable. It comes with adjustable docking to help you fit it perfectly on your tank. It even has a 24-hour rhythmic light cycle that you can turn on. This can make going out of town a breeze. Like with most anything there are still some downsides. If you’re light gets disconnected or the power goes out then your programmed cycles will be reset. While this isn’t a major deal-breaker it can still be rather annoying to fix. 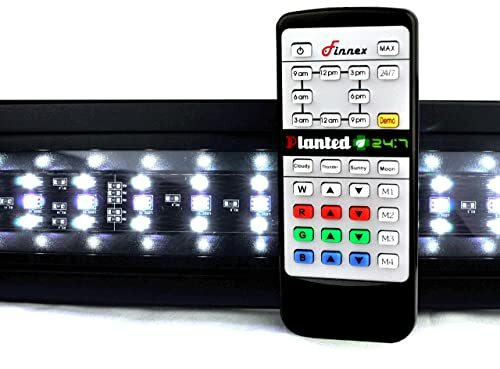 The Finnex Planted+ 24/7 Fully Automated Aquarium LED can help you grow a lush planted aquarium. This LED light has everything you need for a futuristic looking Aquarium. It even comes with an easy-to-use remote control in the package. This product has a night and day cycle. This helps regulate your fish to a more natural schedule. It can even reduce stress in the tank. If you want you can even save custom colors. It’s up to you what you want your aquarium to look like. This light can even simulate the slow rise of the sun. 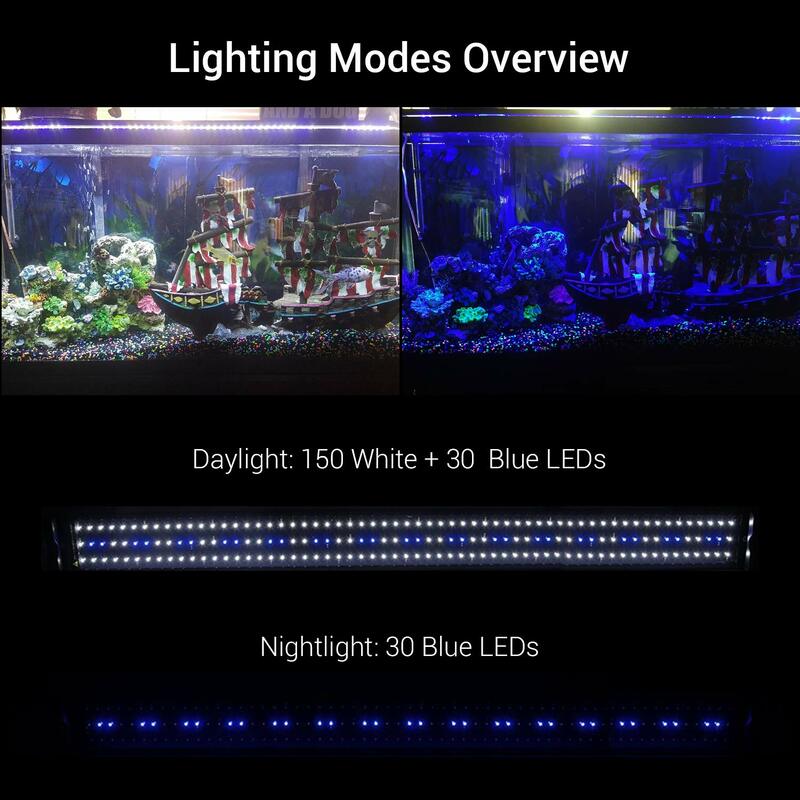 This keeps your fish from being shocked by the sudden change in brightness. This product remembers your last saved pattern even when you turn it off and back on. What is helps keep everything on my schedule. 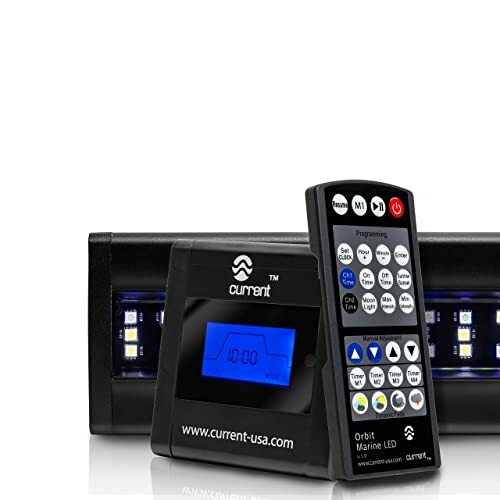 With the included remote you won’t even have to lift a finger to set your light. By just punching in the settings you can watch your aquarium come to life. There are four customizable color channels to choose from in all. 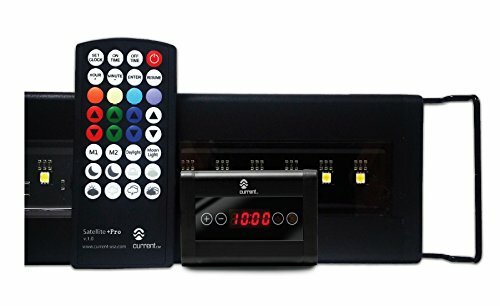 This product does have a few cons though.The receiver on the remote tends to just stop working after a little bit of time. This can be frustrating if you want a wireless experience. You should also note that these lights are not waterproof at all. The Finnex FugeRay Planted+ Aquarium LED Light Plus Moonlights is as beautiful as it sounds. This light is designed for aquariums that need plenty of extra Illumination. 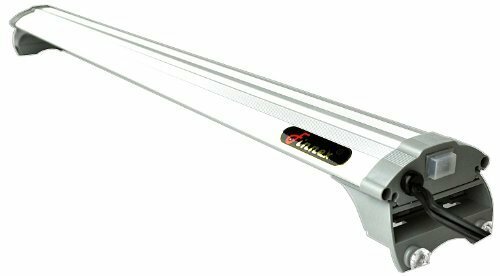 In fact, it is perfect for fish or plants that have specific lighting needs. This light set get up to 40,000 Plus hours of burn time. That’s enough LED life to have these lights on 24/7 and still have them last for years to come. These LEDs are spread over a 120 degree angle to make sure that every inch of your aquarium is lit. This light is designed with an ultra slim body so that it can look good on your tank. it comes in multiple sizes for you to choose from. Additionally, this LED light comes with a splash guard. This protects it from shorting out because of water. Finally, you should know that this light is made out of aluminum. This helps regulate the heat put off by the LEDs. This protects your light from overheating and being damaged. Remember that this light is best for aquariums that need a high amount of light. So what are the downsides to this light? This light actually some bad craftsmanship. It’s not the best put-together product on the market by any means. It also has quite a few power supply issues that could pop up. The NICREW ClassicLED Aquarium Light adds a nice touch to tanks that need lighting. This light is one of the simpler brands on the list. It doesn’t have over complicated patterns or instructions to use. This light features exactly two lighting modes to choose from. The LEDs are made to glow extremely bright and made to be energy-efficient. This helps save on your power bill while providing you with a powerful product. You will need to keep it in mind to cut these lights off occasionally. The recommended amount of time you should leave them on for is between 8 to 10 hours. Any longer than this and you can risk the lights starting to overheat. 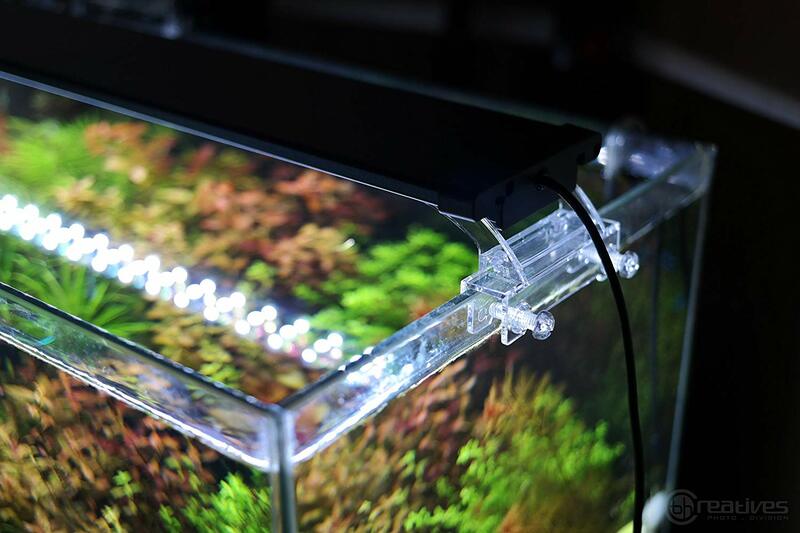 You will only want to use this light over a glass aquarium cover to protect it. It is not waterproof and should never be submerged. Overall, these lights will create a beautiful atmosphere in your tank that you are sure to love. Like with most items are some downsize this product. This light can be a little bit hard to assemble at first. The the power cord can also come loose pretty easily. This can be frustrating to deal with. Listed above are some of the best LED aquarium lighting you can find. You may be wondering what is the best lighting for your tank. There are a ton of lights to pick from and you may not know exactly what you need. There are a few things you should be thinking about though. Let’s start off with the basics. What is the size of your tank? You will need to know how long your tank is in length. This is because you’re going to need a light that will fit on your tank without falling in. If a light falls in it will stop working completely. You might think this is a little strange but most aquarium lights are not waterproof. If they are waterproof they still can’t handle falling directly in water or being submerged. Make sure the light is placed carefully on top of your tank and secured. If you’re having trouble securing your light to your tanks then buy brackets. Brackets are going to help fit a light perfectly on top of your tank. This can decrease the risk of a light falling. You can also use extra tools in order to secure the light to your tank. Now that you figured out what size light you need, in order to have a secure light you need to think about water type. Do you have a saltwater or freshwater tank? Depending on what type of water you have you’re going to need more or less power out of your light. With fresh water tanks you can use less powerful lights. Saltwater tanks, however, need more powerful lights. You will also want to consider what type of fish you are keeping in your tank. There are some species that need dim light while others will need bright light. Most of the time species that live in dimmer environments like the Amazon won’t require much light. On the other hand, fish that live out in the open will crave sunlight. Make sure you do proper research before turning up or down your lights. If you’re planning on having multiple aquariums throughout the years and you buy a long-lasting light make sure it has brightness settings. Brightness settings can let you brighten or dim the lights at your discretion. It’s the perfect choice for the committed fish hobbyist. Next, you want to think about your plants. Do you plan to grow plants in your tank? If so what type of plants would you like to grow in your tank? Do you plan on growing rooted plants or floating plants? Also just how deep is the tank you want to use the light in? Depending on the type of plants you want to grow you will need different severities of lights. Each plant species has different needs that you wanted to look into. You also want to consider the depth of your tank. Deeper tanks will need stronger LEDs to reach the plants. If you plan to grow coral or specialty plants you may need specialty LEDs. This is because plants like coral have special needs that need to be met. These LEDs can cost more and you may have to adjust them a bit before you find the perfect amount of light. For plants that are closer to the surface, like a floating plant, you want to use less light. These plants generally don’t require a lot of light. Some types of molds that grow in your aquarium may need less light. The amount of light will depend on the breed of plant. Now that we’ve gotten the important parts out of the way let’s look at the more aesthetic prospects of lighting. To start with just adding a light your aquarium makes it look much nicer. Just like most things learning can be better or worse depending on the product you buy.Off colored LEDs or LEDs that aren’t as bright are going to look great in a tank. Likewise, LEDs that are too bright can cause an awful glare on the water. Most of the time you want to want to skip the extremely cheap LEDs. The cheap lights can make your aquarium look bad. There are also aquarium lights out there that have multiple colors. This can be aesthetically pleasing as you can cycle through the different patterns. You can choose your favorite color and keep it set there. This can bring a magical look to your tank. If you want to create a more natural environment for your fish then look for light with a day-night cycle. The day-night cycle replicates the natural daylight your fish need. When it’s time for the night the lights will dim just signal to your fish it’s time to sleep. This can be great for fish that are night dwellers but need low light in order to be active. It can also help fight off disease by regulating your fish’s body. Adding a natural light cycle is even proven to decrease stress in your tank. If you want to go out you can even get lights with natural fade. Instead of just switching between day and night settings they will slowly fade in and fade out. This can be a lot more natural for your fish and create a sunset and sunrise effect. Finally, you can get lights that also have weather patterns. This will simulate an incoming rainstorm for your tank. Some lights can even be programmed to cycle through specific patterns for you. This can be perfect if you tend to go outside of town and can’t monitor your tank.If possible, you might even want to get a light with a remote. Remotes make it incredibly easy to program in light patterns. You’re probably wondering just how LED lighting works though. You know the LED lighting is cooler than normal lighting and it lasts longer. But what exactly makes it do these things? You may be wondering how small lights can promote the growth of plants. The trick with LEDs is that there is strength in numbers. Many LED lights use hundreds of tiny bulbs to create the lighting effect. The truth is a single LED on its own isn’t going to do much good. The light system works on the “there is strength in numbers” theory. LEDs are also small. This means they easily fit into a fixture without being bulky. Thanks to their small size the industry can now create aquarium lights that don’t stick out. They also have much longer lives than older style bulbs. Interestingly LEDs don’t contain a filament. This is the element in normal light bulbs that generally breaks. This makes LEDs more durable so you can get more use out of them. Additionally, LED lights are easier to program and fluorescent bulbs. This makes it easier for companies to make lights with day and night patterns. Inside LED’s is aluminum-gallium-arsenide that reacts to create light when electricity is present. Growing plants in your aquarium is one of the primary reasons for purchasing an LED light. There are a few different things that you’re going to need to grow plants properly. For starters, decide whether you want to have a freshwater or saltwater tank. Lights will be marked tell you what type of water they work with. They also tell you just how deep light will reach into your tank. Take this into consideration when buying your light to give your plants the best chance. Each plant has different requirements for growing healthy. You need to have properly researched their environments in order to pick the perfect LED. As long as the plant’s needs are met you should have no problem keeping it alive and send. If you have had a light for a bit you’re probably wondering when to buy a new one. Luckily LEDs are pretty easy to tell when they need replacing. If the LED lights have started to dim then they may be getting close to going out. This is especially true if it’s been years since you bought them. Most LEDs last for an incredibly long time even when used constantly. If a light is still glowing brightly then you have nothing to worry about. Even a little bit of dimming doesn’t mean you need to run out to buy a replacement unit. If you do find that your lights are blinking on and off though you may need to look into getting a new light. Blinking lights are a sure sign of an issue with the power. This could mean that the wires in your light are going bad. You’ve probably noticed that we talk quite a bit about how salt water needs higher light output. There are some pretty good reasons for this that are based on science though. For starters, seawater has salt in it which is dense. Salt can be harder for light to go through. The water is typically more cloudy than that of freshwater and causes trouble for light penetration. Not only that but some saltwater plants need an extra dose of light to thrive. This Is especially true of coral which is infamously hard to grow. Coral needs a very strong light source that many LED lamps can’t provide. Sea plants like anemones are popular but can be just as hard to grow. You may be wondering if it’s better to have a unit with a remote. 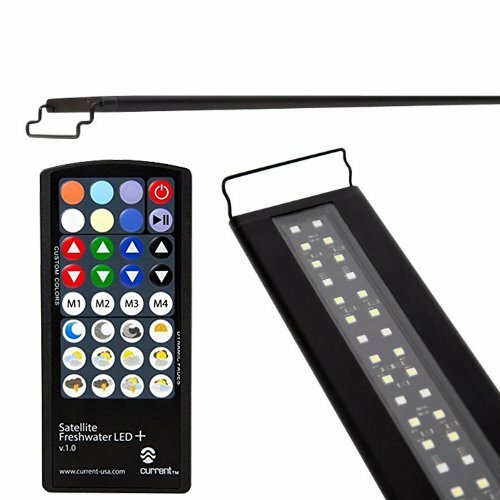 While LEDs with a remote certainly make your life easier they aren’t always better. They are just a convenient addition to many light packages. There are tons of LEDs out there that have the controls on the light itself. While you may have to get up to change your LED they’re just as good. You might be wondering how changing the lights color can affect your fish. Thankfully having a pink aquarium isn’t going to negatively affect them. Many fish don’t have the ability to see the spectrum of colors that we do. Some types of fish even just see in black and white. The biggest thing that’s going to affect your fish is the brightness of the light. You need to consistently make sure the light is neither too bright or too dim to support your aquarium. Cycling through colors has completely no effect on your fish’s overall health. Don’t be afraid to have a bright purple set-up! The simple answer to this question is yes. All lights have the chance of overheating. Thankfully many light companies use aluminum casing to dissipate heat. Some lights even have fans built in to keep this from happening. If your light recommends a rest period then be sure to follow through. Overheating can damage your light causing you to buy a new one. It’s always a good idea to give your lights a break every now and then. Now that you’ve learned all about LED lighting it’s time to pick out your product. 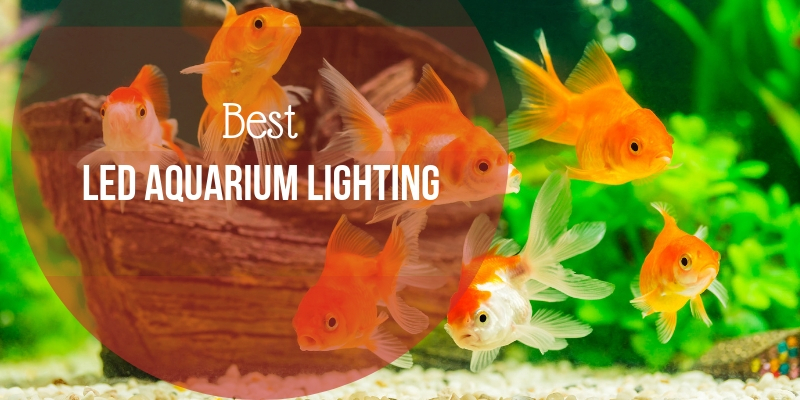 We listed some of the best LED aquarium lighting for you. We’ve also described how LEDs work and what to look for when going to buy a new light for your tank. Make sure that whatever light you pick out will work with your tank size. Also, make sure to do plenty of research into the different breeds of fish in your community. Knowing your lighting need can help you make the perfect selection.